Which Of Your Organs Is Shrinking? Science writer Kathleen McAuliffe tells NPR (and gay blog readers by default) that the human brain (Just the brain? Phew!) has been shrinking for the pass 20,000 years. Men apparently stopped being growers during our Cro-Magnon days. Researchers are debating whether it’s an evolutionary advantage (Smaller brains mean less aggression) or a sign of the complexity of human society allowing for less intelligence in order to survive. 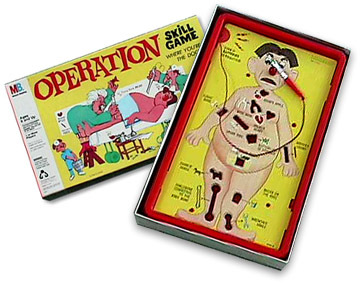 In semi-related news, Who knew that Operation came in a Hulk edition too? !